When most people think of making money on Amazon, selling products is the first thing that usually comes to mind. 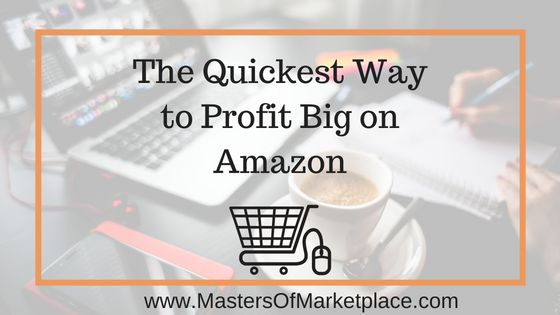 In my last video and blog, I gave you 5 ways to grow your business on Amazon and make more profits. These are fantastic ways to build your business and make some extra cash. But today I wanted to share something a little bit different, something you may have never even considered. Are You an Experienced Amazon Seller? Have you already tried your hand at selling on Amazon? Are you enjoying it, but looking for some additional income that might not involve tracking inventory and selling products? If you already know how to sell on Amazon and navigate the biggest online marketplace in the world, there is a huge market out there for you to monetize that knowledge and experience. Knowing how to sell on Amazon and to navigate their marketplace is a skill that takes many people years to learn, a skill that also has the potential to be very lucrative for those who excel at it. The number of business owners who are now taking their business to Amazon is growing every single day, and there really is a lack of good help out there from people willing to offer Amazon store setup, management and scaling services. Are You a Virtual Assistant Looking for a Marketable Niche? VA’s are always looking for new skills to help set them apart and make them more marketable to businesses. If you already know how to sell on Amazon, think about becoming an Amazon store manager. It’s an impressive skillset to have as a virtual assistant because there are countless companies out there who are looking for these specific skills. You have the option of becoming a freelancer, a contractor, or even being hired full-time by larger companies or entrepreneurs. Many business owners just don’t have the time to manage their stores themselves. If you already know how to sell on Amazon, your next step is to go out and find someone who needs help with their store. I have an Amazon consulting agency that helps businesses set up and launch their products on Amazon, so I see first hand the need that exists in the business world for knowledgeable people who can set up and manage Amazon stores. I’ve been selling on Amazon for almost ten years, and I use that experience to help others grow their businesses. The first time I offered my Amazon skills as a service was for my former boss who wanted to sell his supplements on Amazon. It turned out to be an incredible experience and we were able to grow his store immensely. This eventually led me to open my own consulting business that I run today along with my team. We manage several stores, and I love every second of it, but my other passion is to teach people like you how to sell on Amazon, and how you can then offer those skills as a service to others. Knowing how to create product listings, manage Amazon stores, and help business owners make money is a highly sought after, in-demand skillset that can help you make money today. Masters of Marketplace is my online platform where I teach people how to sell on Amazon, and I’d love to see you there! Whether it’s for yourself, your boss, or your clients, I highly recommend you come check out the site, take a look around and see all the different opportunities there are to make money on Amazon. If you’re interested in learning more about marketing your Amazon skills as a service to others, there’s no better place to start. You can also subscribe to my YouTube channel to see the videos I post each week.